All of our cards are manufactured in the UK on paper from sustainable sources. In addition to this all of our packs are manufactured to EN71 guidelines, which ensures that not only are you safe, but so are the forests where the paper originated from. Computers can be a great tool to help you learn maths, which is the reason why we've developed the applications on this site. Every now and then though, it's good to take a break from the mouse and try something different. So we've developed a number of sets of Flash cards to help you learn multiplication and division facts whilst away from the computer, either on your own or with friends. Standard flash cards have been used for generations, but ours come with a twist. 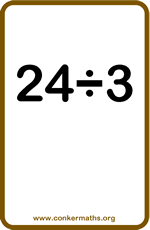 When you turn the card the back not only contains the answer, but also either a hint to help work out the answer in the future or a fact about the number which may make it easier to recall the answer in the future. The purchasing part of our application is handled by PayPal. You don't need a paypal account to buy cards, since all major credit cards are supported. If you have a paypal account through, you'll know that it'll be even easier than using a credit card. If you have any questions about delivery, prices etc please check out the link on the left. If you are planning to buy more than four packs or woudl like to discuss options for reselling our cards through your School, please contact us directly on sales@conkerit.com or by using the number below. Why not buy the complete set and save 50p per pack. This also includes free P&P. Multiplication is one of the fundamental skills for success in Mathematics. These cards are designed to improve recall of the following tables: 1,2,4,5 and 10 Each card contains a sum on one side and the answer on the reverse. Along with the answer, each card contains either a hint to help the calculation or a fun fact about the number which can help to recall the answer in the future. Division is probably the hardest of the fundamental skills for success in Mathematics. These cards are designed to improve recall of the following tables: 1,2,4,5 and 10 Each card contains a sum on one side and the answer on the reverse. Along with the answer, each card contains either a hint to help the calculation or a fun fact about the number which can help to recall the answer in the future. Multiplication is one of the fundamental skills for success in Mathematics. These cards are designed to improve recall of the following tables: 3,6,7,8 and 9 Each card contains a sum on one side and the answer on the reverse. Along with the answer, each card contains either a hint to help the calculation or a fun fact about the number which can help to recall the answer in the future. Division is probably the hardest of the fundamental skills for success in Mathematics. These cards are designed to improve recall of the following tables: 3,6,7,8 and 9 Each card contains a sum on one side and the answer on the reverse. Along with the answer, each card contains either a hint to help the calculation or a fun fact about the number which can help to recall the answer in the future.